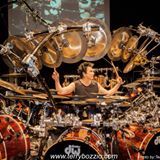 Terry Bozzio is more than a timekeeper or drummer, and lives in a world of searching for the correct emphathetic sounds. Virtually no introduction is required for Terry Bozzio. His long career of polyrhythmic time signatures and percussive empathy has encompassed the 40-year mark which includes scaring various musicians like Frank Zappa and Jeff Beck with his technical prowess in their bands as a drummer, along with pop forays in a band with former partner, Dale Bozzio, in the band, Missing Persons. Above all, he is one of those rare people that finds joy in his craft and the freedom in pursuit of that ethereal art form called, “music.” Like the true visionary that was John Coltrane, there is always something to hear and to attempt playing by finding inspiration on another level. That pursuit, and energy, is being brought home through a series of personal appearances entitled, simply, “An Evening With Terry Bozzio.” More than a performance situation, it allows an intimate format for interaction between the people in attendance and an artist eager to impart what he has learned. Aspiring drummers have long followed his adventures, gleaning what they could from his numerous projects. Even limited collector pieces like the 1993 “Salad Party,” a DVD compilation of Frank Zappa’s latter days recording collaborations pairing Tuvan throat singers with the legendary Kangar-Al and The Chieftains, are treasured by fans. In one segment, there is Bozzio supplying measured rhythm on a doumbek for a third world musician. Bozzio brings his program to Martyr’s Lounge in Chicago, Oct. 5-6 at 8:00 p.m., for a close encounter highlighting an enclave of entertainment, stories, instruction, and pure joy. Located at 3855 N. Lincoln, Martyr’s (www.martyrslive.com) is sadly his only scheduled local stop in Illinois or Wisconsin. Information on attending can be obtained by calling 1-773-404-9494. Despite an itinerary of constant motion from touring and visiting different places, he managed to sit down for an email interview, linked together through Glass Onyon PR’s Billy James, answering some odd questions. What emerged from the quizzing revealed an articulate gentleman, and a keen intellect…one that is most capable of translating insanely intricate drum charts like Zappa’s “The Black Page No. 1 and No. 2” into practical expression. Maximum Ink: Much of your style is rooted in drum rudiments like paradiddles, and eastern rhythmic influences. Have you ever considered projects working with derivative armenian beats? Terry Bozzio: I disagree with that analysis! I define my style as coming from three distinct schools of music. (The first is) classical…because it’s using the five basic elements of music which are rhythm, melody, harmony, dynamics, and orchestration. And I use accepted compositional techniques in my pieces. All of the above are easily understood by any classical musician trained in the Western European tradition. (Second) I am not using derivative Armenian beats. Rather, I am inspired by ethnic percussionists from around the world, from almost all cultures. Many styles from Africa, Asia, the Middle East, North and South America, and Afro-Caribbean. My pieces are often titled with the proper name of the rhythm I am using as a basis for the composition. Third is improvisation, in which jazz has been a major influence. But not the trad-jazz most people think of! To me, jazz means freedom to intuitively express yourself spontaneously, but in a compositional manner. Not just shred some licks you’ve been practicing. Miles Davis, Joe Zawinul and Weather Report were my main influences because their music was all-encompassing in its scope. From electronic to classical to jazz, rock, funk, ethnic music, film score, ambient, etc., it was used and in an improvisational way that kept it growing, evolving and changing. This was done by highly schooled musicians who had large vocabularies but (also) tasteful restraint and unique authentic styles of expression. You spoke of paradiddles! That rudiment is just one of several hundred mixed sticking permutations in one small area of drumming technique that I use, as I see fit to use, to express my musical ideas. People who use rudimental ideas as such, don’t usually make music. It’s the equivalent of pointing out the word “the” in a line of Shakespeare! MI: Your cymbal work is amazing. What sounds do you listen for, in order to integrate it into the percussive fabric of your playing? TB: I designed my Radia cymbals with Sabian (cymbals) for a shorter sustain, more of a pronounced pitch, for a better result when playing them melodically. You can’t do melodic scales on normal cymbals because the sustain is too much and does not have enough pitch in their sound. MI: As a consummate player, what gives you the most joy among playing your percussive instruments? TB: I have a pretty good collection, and love them all! I guess my Gon-Bops El Toro Cajon is a favorite right now, as I’m playing it in the show. TB: I guess I would say make sure you understand the rhythms first. Then, work out the stickings for the melodies. Then always use those stickings, and practice until you have it rooted in your motor muscle memory. MI: How do you rate Zildjian vs. Pastie cymbals? TB: All musical instruments, if the company has achieved a level of excellent quality, are then a matter of the musician’s personal taste. MI: In small combos, your playing is very beautiful and empathetic to the other artists. What cues do you listen for? TB: It’s just a matter of really listening. Much like a conversation. You try to comment but not interrupt, and perhaps suggest another topic or point of view at the same time. MI: The 1977-78 Zappa bands were labeled as a “clown” band, possibly due to the skits and the live performance from the movie, “Baby Snakes.” Zappa even railed against this notion, as band members Adrian Belew, Tommy Mars,Patrick O’Hearn, Ed Mann and yourself are all crack musicians. There is an appreciation for that ensemble resulting from the musical parts being so crowded. How did you manage to tuck in those neat fills, and what pieces still stand out for you? Fills are fills. And when you’re young, you suffer from trying to put in too many. I did not escape that pitfall! I loved both of the “Black Page” versions, and the funny stuff I got to sing lead on. MI: What future projects are on the horizon, and what projects do you want to pursue? TB: Well, I’m going to be doing these 40 concerts in the U.S. and Canada until Oct. 26, then I go to Japan, for a West Japan solo tour. Then, end of November, we play Japan with the Heavy Metal BeBop Band with myself, Randy Brecker, and the original members from the Brecker Bros. album. I’ll be staying on in Japan, where I live part time with my wife, Mayumi, and our family, and doing more painting, composing, and practicing for a while. Then back to Europe for more solo shows. MI: I compare you to John Coltrane. Early on, he would play the melody of a song, and branch out a little. Near the end, it was a snippet run-through of the melody, then off to the races…as if trying to play along with something only he could hear…a frenetic pace of every note around the spaces in the melody. Your playing style approaches that level. What do you see? What guides you? TB: Well, Coltrane was approaching complete mastery of his instrument. He studied out of “(Nicholas) Slonimski’s Thesaurus of Scales & Melodic Patterns.” I happened to have met Nicolas, through Zappa, and have an autographed copy of his book, which I treasure! So, Coltrane was a visionary, and like all visionaries in music or art…they see and hear things we don’t, and in the process of sharing that with us, they enlighten us and change the way we see music or art. Then it evolves and moves forward. Old concepts become outdated, and discarded, for the newly invented ones. But what you refer to is a compositional technique called fragmentation, and/or transformation. I’m improvisation. Most classical music and jazz is the “ABA” form. “A” is the exposition, or the head, in jazz. “B” is the development of themes, or the improvised solo, in jazz. “C” is the recapitulation of the “A” theme, or a return to the head or melody in jazz. What Coltrane did is like a coda where he resolves the structure by returning to the melody, but only a fragment of it. Then, (he) improvises on the melody or parts of it extending up into the higher or superimposed notes of the chords as the ending. When I play, I describe it as a borderline state between unconscious intuitive parts of the mind and the conscious intellectual part. You dip into the unconscious, and let go. But when things come out that are cool, that surprise you, you have to be hyper-aware of what it is, so you can analyze it, repeat it, develop it, etc., and use all the tools you have to make it work…so it’s not just a fluke event. That’s the real magic of improvisation!